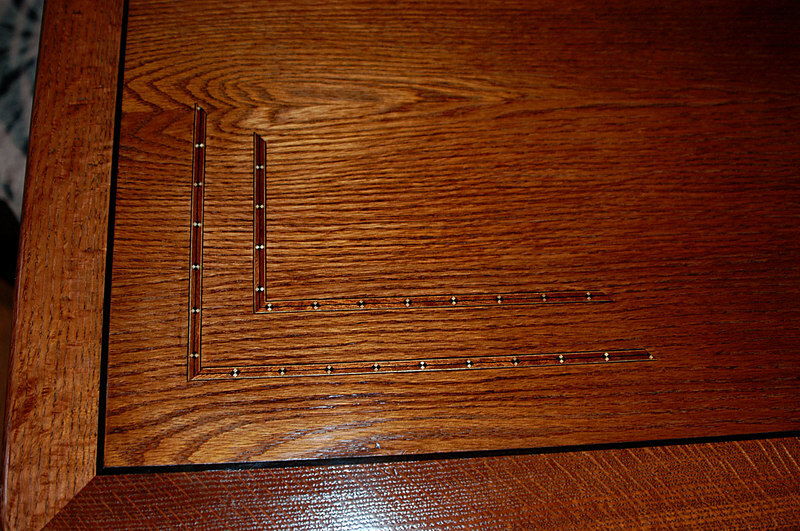 Doug Rasmussen (view 2) designed and built this red oak Dinning Room Table with two leafs (one shown). The top is oak veneer with quarter sawn oak edging. The top incorporates Ebony string inlay and manufactured inlay. The 45 degree legs are attached using hanger bolts through corner brackets making them detachable. It was finished with red mahogany water based dye, Zinsser Seal Coat, Crystal Lac Filler (top only) & Poly -Urethane. The top was rubbed out with Wizards Shine Master automotive finish rubbing compound.